The Jillian Michaels Ultimate Parent Sweepstakes is offered only to legal residents of the fifty (50) U.S. States and the District of Columbia who are eighteen (18) years or older. The Jillian Michaels Ultimate Parent Sweepstakes ends on July 14 at 11:59:59 PM ET. An entrant must visit ultimateparentsweeps.com, enter his or her email address, and follow the instructions to register by entering all information requested on the registration form. 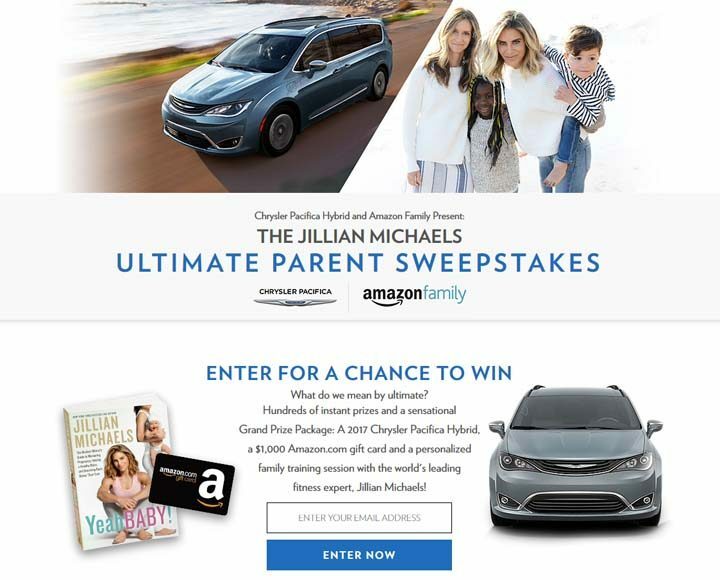 Sweepstakes Grand Prize (1): The Sweepstakes grand prize is a 2017 Chrysler Pacifica Hybrid Platinum; a three (3) day/two (2) night trip to Malibu, California for winner and three (3) guests; a personalized family training session with Jillian Michaels for winner and three (3) guests; and a $1,000 Amazon.com Gift Card. Vehicle MSRP: $47,935. Trip includes round-trip coach class air transportation from a major commercial airport near winner’s residence to Malibu, California for winner and three (3) guests; two (2) nights hotel standard accommodations; ground transportation; and a check for $1,500 made payable to the winner. The Sweepstakes Grand Prize ARV is $59,185. One (1) Sweepstakes Grand Prize will be available in the Promotion. Sweepstakes Runner-Up Prizes (20): The Sweepstakes runner-up prize is a $200 Amazon.com Gift Card. The ARV of each Sweepstakes Runner-Up Prize is $200. Twenty (20) Sweepstakes Runner-Up Prizes will be available in the Promotion. Game Prizes: The following Game prizes will be available in the Promotion: Game Prize Quantity ARV (each) ARV (total) “Yeah, Baby!” book by Jillian Michaels 200 $13.85 $2,770 Jillian Michaels – Training and Meals Plans app promo code 100 $9.99 $999. Total ARV: The total ARV of all available prizes in the Promotion is $66,954.